India, under the guidance of its National Planning Committee, NITI AAYOG, has launched an energy revolution, referred to as “the Methanol Economy.” This revolution will transition India’s energy economy from fossil fuels, wood and low-grade solid fuels to clean-burning, low carbon, liquid fuel—methanol fuel. The revolution embraces fuel for engines, turbines, boilers, fuel cells and simple cookstoves. It will impact automobile, truck and bus transport, marine transport, electricity generation, heating and cooling, and even cooking. This event kicks off the methanol for cooking program. 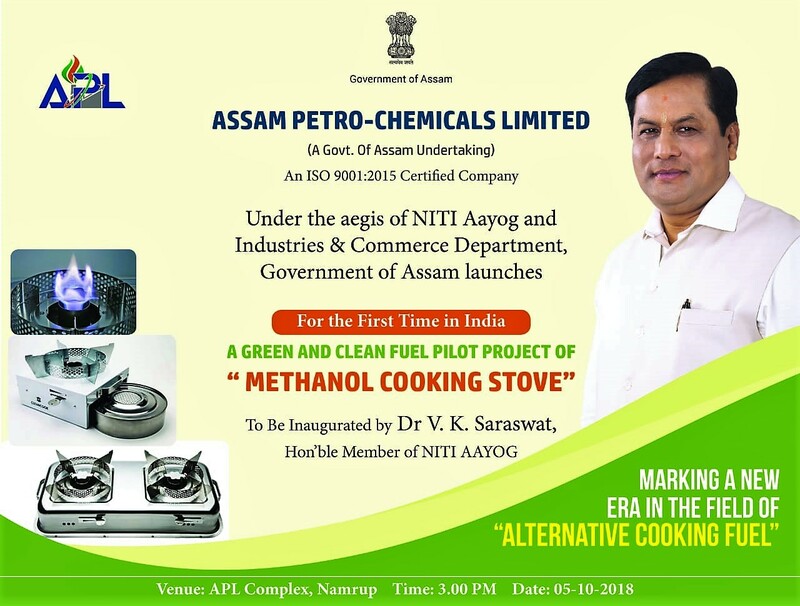 The Government of Assam, through its Assam Petro-chemicals Ltd. (APL) company, has purchased methanol cookstoves from CleanCook Sweden AB and will launch them in the APL community. With the support of the Methanol Institute and Project Gaia, Inc., the Government of Assam and NITI AAYOG will assess the use and acceptance of the cookstoves in preparation for a national plan for clean cooking. There are three important reasons for India’s bold action. Methanol fuel may be made from any carbon source, including recycled carbon. This includes carbon emitted from industrial stacks or mined from landfills. It includes carbon wasted when gas is flared or when methane leaks from a landfill. It even includes carbon that is taken out of the atmosphere. Thus, methanol represents an important greenhouse gas reduction and climate change mitigation strategy for India—and one which the world could follow. Methanol is a hydrogen fuel (it contains more hydrogen than liquid hydrogen) that burns easily and cleanly in engines and in simple devices like cookstoves. The use of methanol in place of diesel, petrol or kerosene, or wood and charcoal, eliminates pollution—namely black carbon or soot particles (PM2.5), carbon monoxide (CO), and volatile organic compounds (VOCs) like benzene. When methanol burns, it converts to carbon dioxide and water vapor. If the carbon in the fuel comes from recycled carbon, then the combustion process is carbon neutral. Black carbon, CO and VOCs are extremely harmful to health. These pollutants are encountered as ambient air pollution (city smog) and indoor air pollution. They sicken and kill more people, according to the World Health Organization, than any other environmental killer. Only the switch to clean burning fuels like methanol can reduce or eliminate this risk. Methanol allows India to move away from dependence on imported fossil fuels. India can produce all the methanol it needs to fuel its economy from stored, wasted and renewable resources within India. The Methanol Economy is a circular economy that enables the reuse of resources over and over again. As with any resource recycling, this creates jobs, livelihoods and wealth—the opportunity for India to support itself and become energy independent. These are three reasons for India’s bold action—its launch of the Methanol Energy Revolution. Dr. V.K. Saraswat, Member of the NITI AAYOG and an important thought leader in this transition to clean energy, will keynote the inaugural ceremony. Please take a moment and watch our video demonstration plus information videos from Project Gaia.